Auria Abraham scrambled to find a new kitchen and warehouse last October. Pilotworks, the Brooklyn food incubator that housed her and 174 other small food businesses, abruptly shut down. Abraham, the mastermind behind Auria's Malaysian Kitchen, a jarred condiment line, says that a few men went in on a Saturday morning and told them, "You have two hours to clean up and get out." Abraham didn’t waste time mourning the loss. Instead, she secured a kitchen in Industry City—a complex in the Sunset Park neighborhood of Brooklyn—and carried on making and selling pandan and salted caramel kaya spreads and lime leaf and hot chili sambals. Back in 2013, when Abraham initially tried to coax people into using sambal at food demos in Brooklyn or Long Island, she was met with resistance and even disgust. Not many really understood what sambal was, nor did they care to learn, she says. "This one woman took the sample from me and with her finger, she brushed the sambal off the bread, and put it into the trash. Then, she ate the bread and walked away," Abraham recalls, laughing. The experience was sobering; Abraham realized that Americans needed a Malaysian food education. Abraham, who was born and raised in Seremban, Malaysia, spent much of her childhood in the kitchen with her mom and aunties. Abraham’s mother, who was a school principal, taught her daughter the use of spices and herbs like fenugreek, cardamom, galangal, and turmeric. Dishes like beef rendang or laksa were readily available wherever she went — whether it was from her mom’s kitchen or her favorite mamak stalls, open-air food carts, down the street. 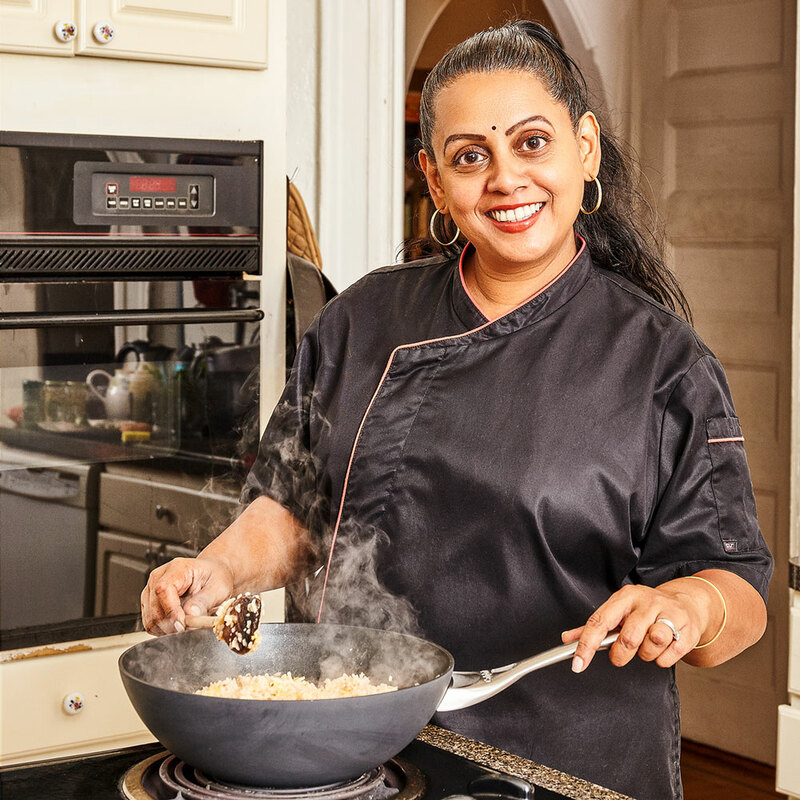 When she moved to the U.S. in 1992 to study at Berklee College of Music, she suddenly had zero access to her favorite home dishes, like mamak mee, an Indian fried noodle, or roti canai, a buttery flatbread typically served with a bowl of piping hot fish or chicken curry. Like many college students living in the dorms, she ate at the school cafeteria. She says that the cafeteria meals were so unfamiliar to her that she resorted to eating fruity pebbles topped with soft-serve ice cream. One day, she read "rice" on the cafeteria’s menu. She was overjoyed. That is, until she saw the color of the dish. With the help of her mom, Abraham packed Malaysian ingredients in her suitcase when she first moved to Boston. She brought curry powders, chilli powder, ikan bilis (Malaysian fried anchovies), dried shrimp, belacan (shrimp paste), cinnamon bark, cardamom, cloves, cumin, fennel seed, turmeric, fenugreek, mustard seeds, and soy sauce. “Mum even packed a small wok, four Chinese rice bowls, and two Indian hammered copper pots,” Abraham says. To get started, she phoned her mom for guidance. In true Malay form, her mom didn’t offer exact measurements. (In Malay cooking, “agak-agak,” which means to estimate or guess, is often used in lieu of “an ounce” or “a tablespoon.”) Sambal shrimp was the first dish she cooked for a group of friends who had never eaten Malaysian food. Even though she didn’t hold back on the tear-inducing heat, her friends were hooked. By trial and error, Abraham developed a rhythm for finding just the right agak-agak by faithfully following the methods she watched her mother use in the kitchen. Abraham went on to pursue a career in music production for television commercials, but her love for cooking was steadfast as she hosted dinner parties for friends. Then, in 2011 while living in New York City, Abraham created an underground supper club series, where she hosted up to 20 people at a time. On her menu, she featured dishes that she had longed for when she first moved to the U.S.: beef rendang, chili soft shell crab, and curry laksa. Word spread quickly. From there, she started selling sambal at pop-up markets, food festivals, and demos. Abraham is making it her mission to bring as many Malaysian products to American consumers as possible. 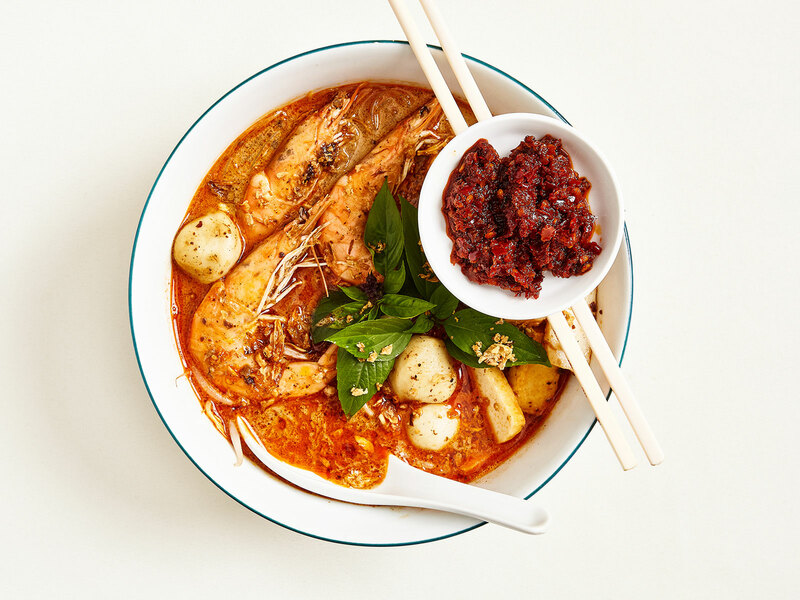 This year, she’s hoping to launch four new products — one of which is a laksa paste. 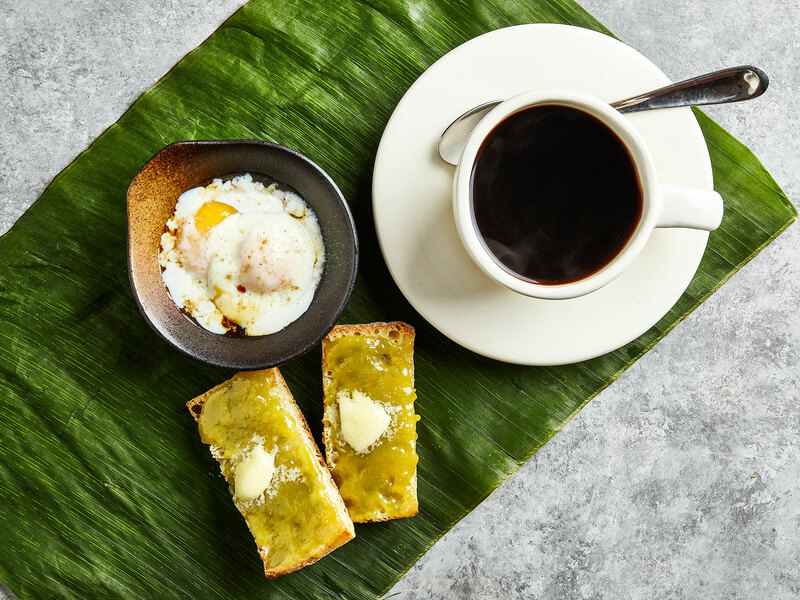 In August, Abraham is headed to Malacca, an hour south of her hometown, for a six-day food tour to spotlight the country’s multicultural culinary landscape. Every year, Abraham takes the trip takes with her brothers who still live there, but this time she’s inviting anyone looking to gain a deeper understanding of her country’s foodways. The tour will also visit Kuala Lumpur and Penang, where guests will dine at Abraham’s beloved eateries and learn about the methods and flavors through hawker markets, lunches served on banana leaves, and banquet dinners. Five years ago, Abraham began doing demos every week, appearing at markets around the city to enlighten the skeptics. Eventually, she earned the nickname “Sambal Lady.” She developed recipes like mee goreng and shrimp sambal and shared them on her website as well as on Facebook and Instagram. Even though Abraham doesn't necessarily credit her company to the rise of popularity for Malaysian cuisine in U.S., she's heartened by it. Abraham has most recently found solidarity in a Facebook group called Global Malaysian Network. She says the group organized last year for the Malaysian election, where the aim was to oust Prime Minister Najib Razak. Malaysian expats all over the world mailed absentee ballots to central locations for a designated person to fly home. "But now that the election is over and things turned out well, we are going back to talking about what Malaysians love best and that's our food. The conversation is all about, 'Where do you get your ingredients from?' 'What ingredients can you get?' 'If you can't get these Malaysian ingredients, what are you using as substitutes? '” she says. "Let's find these voices of women who have cooked these cuisines their entire life. It's not even something they learned, it's something that's inside of them," Abraham says. "Let's uncover those voices so we can find the traditional ways of cooking so we can honor these cuisines."